Info "Oh no! The walls are falling apart! Don't let me get squished! " Drywall Dodge is one of Wario-Man's microgames in WarioWare: Twisted! 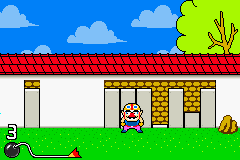 The player must tilt the Game Boy Advance to move Wario around and avoid the falling walls. The gameplay is similar to that of the Arrow Space microgame from WarioWare, Inc.: Mega Microgame$! Level 1: 7 pieces of wall fall down. Level 2: 8 pieces of wall fall down. Level 3: 9 pieces of wall fall down. In WarioWare Gold, this microgame is incorporated into the returning Arrow Space microgame for the second and third difficulty levels. This page was last edited on October 2, 2018, at 06:01.